More than 100 turtles that were found in the Atlantic Ocean, had plastic microparticles in the intestines, say specialists. The study, conducted by Professor Brendan Godley, and other researchers, revealed the seriousness of the pollution of the oceans . Not only dead turtles were found in the Atlantic Ocean, but also in the Pacific and the Mediterranean and all had plastic in their intestines . This reveals the large amount of plastics that humans drop into the oceans. 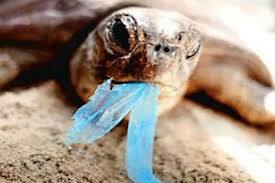 The plastics, when they decompose, become microparticles that the marine creatures ingest until they die . Professor Godley used the collected evidence to warn of the importance of taking measures to control the use of plastic on our planet , since it almost always ends up in the stomachs of sea creatures. Not only that, but recent studies have even detected plastic particles in people’s feces. According to National Geographic , microplastics have already been found in birds, fish and whales , so it should not be surprising that they have been discovered in humans. The study found that tiny plastic particles and fibers were found in the faeces of eight Europeans who provided samples as part of a pilot study. The news confirms the predictions of researchers who have tracked microplastics in remote locations and identified these small particles in drinking water, beer, table salt and seafood . But the implications in this particular case remain unclear. In another case, up to 6 kilos of plastic waste were discovered in the form of at least a thousand objects such as bottles, glasses and even sandals, in the stomach of a sperm whale. The sperm whale is a type of cetacean that is characterised by its size. This marine mammal can reach 20 meters in length and weigh more than 50 tons. The specimen found in the Wakatobi National Park, however, did not measure more than 10 meters . Each year, 13 million tons of plastics reach the seas of the world , according to an environmental study of the United Nations.